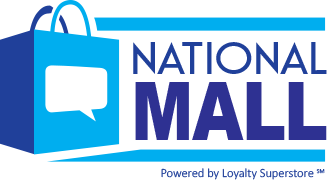 ("National Mall℠") offers a service that allows members to earn cash back on purchases made at over 1,200 stores. Joining and using National Mall℠ is free and simple, requiring only your email address and a password to get started National Mall℠ does not sell or rent your personal information to third parties, and National Mall℠ does not 'spam' its members. Please read this complete member agreement ("Agreement") and FAQs for full details on the National Mall℠ Cash Back Shopping Program ("Program"). To become a member, click "SIGN UP" on the Home Page. Fill in the blank area and click the "Join Now" button. You will be registered and automatically logged in. Click the 'Login In' button located in the top right corner of the Mall's website. A form will pop open. In this form, type in your login email and password, then press the 'Login In' button. In order to shop and receive your cash back rebates, you must be logged into this Mall site. Click on any one of the Categories on the left side and then click on the Merchant of your choice. Once the merchant information is displayed, you will see a "Shop Now" button. By clicking the button you will be taken to the merchant's site. Any qualified purchase you make from that merchants site will be applied to your account. How to Manage My Account? After you click "Log In", click the "My Account" link located next to your name in the upper right hand corner. This is a current snapshot of your Rewards history. Depending on the mall you are a member of, you may also see redemption options. Your "My Account" page gives you an overview of your account and offers links to more in-depth information. There are links to see your entire purchase history detail including merchant, date, amount of invoice and amount earned. If you don't see a purchase you made, submit a request using the form located in the "Request Rewards" section. We will contact the merchant on your behalf and try to locate your purchase information. You may also leave feedback for the merchants you have purchased through by clicking the feedback icon and completing the short form. We encourage members to use this feature as it will assist other members deciding on merchants. Every account is distinguished by a unique identifier. Only one email address per account is allowed. Should you set up multiple account, you must use a different email address. You will have to log in and out of each account to have the Rewards applied to the desired account the purchase was made through. We do not support the redistribution of Rewards for members with multiple accounts. We will not merge accounts for members with multiple accounts..
Log into the mall and proceed to the "My Account" section. Under the "My Profile" tab you will see an option to cancel your account. After clicking that link you will be prompted to confirm your decision to avoid accidental account cancellation. Once your account is canceled you will be logged out of the mall and your account will be removed. E-Alerts are emails that go out either for promotional purposes or system generated emails. You will receive E-Alerts whenever you are awarded rewards from a purchase. You will receive another E-Alert when those rewards become active. You will also receive a variety of promotional E-Alerts. Earning Rewards: Simply by shopping through this site. The amount of earnings varies between merchants. Earnings normally post as pending in your account within 14 days. If you do not see a credit or a credit hold in your account history within 14 days, please file a Point Request Ticket located in the "My Account" section and we will investigate with the merchant. Rewards are shown as pending for 45 days from date of purchase. This is to detour fraud and provide for cancellations of credits by the merchants. Redeeming Rewards: Redeeming Rewards: Following 45 days after your purchase has been posted to your account, your Rewards will become available for use.You can then click the "Request Check" Button on the "My Account" page and enter the amount of available Rewards you want to receive. You can only request a check when you have a minimum of $25.00 in available rewards points. (1 Reward Point = $1.00 USD) . You may also donate your rewards to one of the listed charities. Some sites may have other donation options. Why was I not Awarded Rewards on a Purchase? Normally rewards are awarded within 14 days of purchase. Whenever you make a purchase that requires you to fulfill a reservation, you will not receive rewards until the reservation has been fulfilled. This applies to airfare, cruise, hotel and rental car reservations. Although we make every effort to award Rewards on all qualified purchases, we cannot pay out if the merchant does not pay us. In this unlikely scenario after reasonable investigation, if we cannot obtain credit from the merchant, your account will not be credited. Here are some reasons that may result in no rewards being earned. 1) You cancelled a product/service before receiving credit. 2) You added an item to your cart at the merchant's site and then logged into the rewards mall and returned to the merchant's site. In this scenario the merchant does not see the purchase as being referred by the mall. 3) The item you purchased from the merchant was excluded from the rewards program. Some merchants exclude items such as laptops and other low margin products (e.g. Best Buy does not pay rewards on laptops). Most of these are defined in the merchant description. Do I need to enable cookies to receive credits? Yes. In order to receive credit for most offers and shopping, you must enable cookies. This is how the merchants track your transactions. Most browsers by default allow cookies. Our cookies are unobtrusive and are only used to gather information in an effort to assure members rightfully receive their Rewards. Can I use the Online Rewards program if I don’t live in the US? If the merchant accepts payment and ships to your country you can use the Online Rewards program.